Explanation of how to verify if someone is really an "admin", especially from steamrep.com. Don't accept any other kind of verification. If this is your first time here, please be aware SteamRep is not affiliated with Valve, and cannot help you with any issues in Steam. In particular, this means we cannot help you recover any stolen items! All we can do is point you to this guide to keep it from happening again, show you how to check who you're dealing with before your next trade, and quote Steam Support's Item Restoration Policy, which states Steam Support will not return any stolen items, ever. Again, we have no control over this, which is why it's so important you understand how to trade safely. PLEASE MAKE SURE YOU KEEP UP WITH ANY REPORT YOU'VE JUST SUBMITTED!! Check upon it regularly within the first few days to see if Staff has asked for anything additional! PLEASE DO NOT SUBMIT A REPORT AND ABANDON IT!! ALSO PLEASE CONSULT THESE GUIDES TO ENSURE YOU'VE SUBMITTED IT PROPERLY. YOU CAN GO BACK AND REPLY TO THE REPORT TO UPDATE IT WITH PROPER SCREENSHOTS IF NEEDED - DON'T SUBMIT A NEW ONE! Below are a listing of some common scam types, and how to avoid them. It's not possible to list every type of scam, so you may still run across something not listed here, but these are among the more prevalent ones. While trading, it's important to take your time. If someone tries to rush you, they are probably going to scam you. Ignore the pressure, or decline to trade at all and find someone else. Making up stories like having to leave, acting impatient, or threatening to back out on a deal is a signature technique by scammers. Another common trick to cloud your judgement is to make the deal seem really enticing, such as something exceptionally profitable for you. You may even notice a scammer is unusually flexible when bartering over the price if they think you will back out if not met. As a general rule, if an offer sounds too good to be true, it probably is. Nobody is going to legitimately offer you $400 PayPal for your $350 knife. Malware plugins are increasingly common. In this scenario, a scammer will be eager to have you use a well-known trading or cashout website, but require you to install some plugin for Google Chrome or Firefox. Usually they'll claim it "verifies" your items, but they may make up another excuse. They will proceed to have you deposit your skins into the mostly legit website, either while talking or later on, but the plugin will actually rewrite the instructions and links on the legit website's pages. When you try to deposit your skins for sale, you'll end up trading with the scammer's smurf account, dressed up to look like a bot. These plugins are widespread, hard to spot, and usually not taken down very quickly. Sometimes they have hundreds or thousands of (fake) positive reviews to look legit. The scam is easy enough to avoid: Never, under any circumstances, install any kind of software when in a trade, or at the request of a trader. Browser plugins are practically full-blown software applications, and installing them because someone on the internet told you to is about as safe as opening .exe files from emails. SteamRep does not have any official plugins (if you're looking for one, we recommend Enhanced Steam). Legitimate trading websites generally do not have any official plugins. Fake websites are often run hand-in-hand with malware plugins. The scammer tells you about a gambling or cashout website, and says you should deposit your items into it. He may claim to be a "moderator" on a gambling site, asking you to "partner" with him to cheat other people (honestly, why would you ever trust someone like this?! ), or he may claim that he had good experiences with it and point out their low fees. The fake may be listed alongside several other websites, legitimate or otherwise. If you don't encounter them on a regular basis, fake websites may be hard to spot; they're often very professionally designed, to the point of fake "users" chatting in them about trades/bets. Important note about trading and betting websites: Once you deposit your items, you are completely, 100% at the mercy of whoever is running the website. You have zero recourse if they decide not to return your items. They are not affiliated with Valve in any way, and Steam Support will not help you. Suing the website owner will not work, as you will probably never even find the real owner, much less convince a judge to hear your case. Sometimes you may be able to have the site shut down (sometimes the host enables crime and refuses), but it's usually a brand new site anyway, and that will not recover your items; the scammer will just re-use the same code and insert a different website name within another hour. Furthermore, almost all betting sites are scams, and the few that aren't risk being shut down by Valve because gambling is against the terms of service. The easiest way to avoid fake websites is simply never trade on a website you haven't heard of before now. A good resource for checking if a website is probably a scam is scamadviser.com. It's not fool-proof, and I don't recommend going by their trust "score", but some of the main red flags to look for include age of the website, anonymous registration, or websites hosting in Russia or other regions commonly prone to scams. Additionally, if you find a list of other trading/betting websites associated with the same server, you're most likely dealing with a scam. 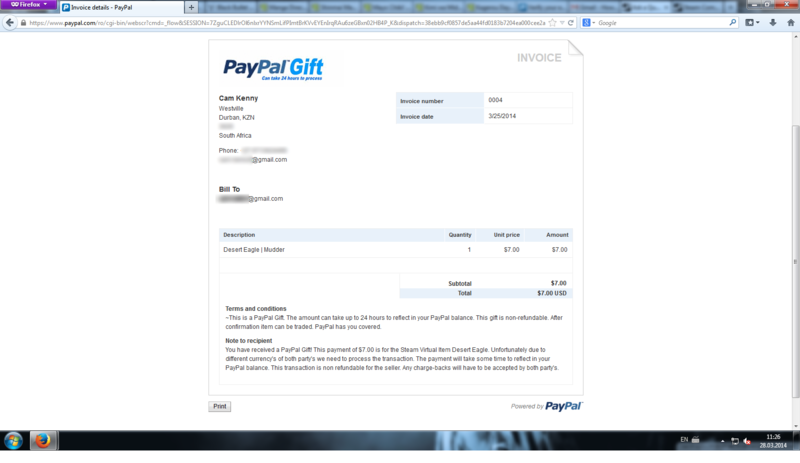 PayPal "gift" invoices are a common and widespread scam. Someone who wants to buy your items, but only deals with PayPal, may claim to send you a PayPal gift, in which they say the funds will appear shortly. In actuality, there is no such feature in PayPal, you will never receive that money, and they have dressed up an invoice as a payment with bogus custom headers and branding. If you "accept" the invoice, you will be sending money to the scammer, not receiving money, and if you send your items, you will not be paid. Instead of asking you to "accept" the invoice, the scammer may set it to "marked as paid"; to PayPal, this means the sender asserts you paid them through other means (mailing a check, etc. ), and if you're not familiar with PayPal it may be unclear and seem like your money is "on its way" like the scammer says. Similar in principle to fake PayPal invoices are Steam Wallet scams. It's important to realize that you cannot transfer Steam Wallet between accounts through trading. The only way to transfer funds is through the community market (more on that below). In the past, this was done using the /me command in chat (now removed) to change the color of text and appear like a system message. Today, with that functionality stripped, the "system message" is added into trade offer notes. Any trade offer claiming you will receive Steam Wallet funds after accepting is a scam, and you should not accept it. A more dangerous variation of Steam Wallet fraud is aimed at people who realize Steam Wallet can't be transferred through trades. Instead of sending a bogus trade offer, the scammer may ask you to list an item in the Community Market at the price you seek, well above the market price, and promise to buy the item. While the scammer may simply run if you send the items before he "pays", they may instead buy it from a brand new throwaway account with a stolen credit card. You immediately receive money credited to your Steam Wallet, but a few days or weeks later the charge is reversed, the scammer is long gone with your items, and adding insult to injury Valve will trade ban or suspend your account for fraud or money laundering along with the scammer's alt. Alternatively, the scammer may ask you to buy the item at an inflated price in return for receiving a different item. 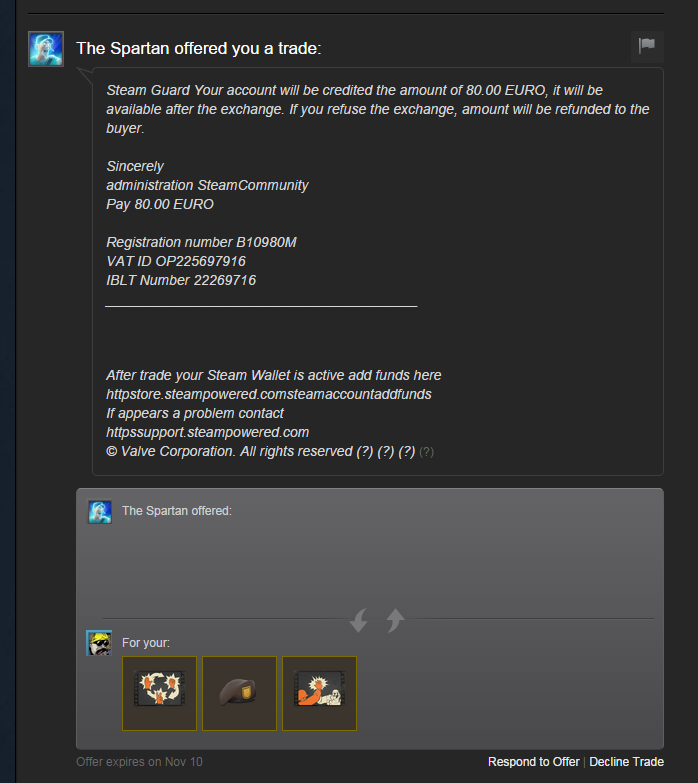 The scammer may run with your money without sending the promised items if you go first, and then this unusual one-sided market transaction can similarly result in a trade ban or worse punishment from Valve. If someone tries to use the Steam Market as a medium for transferring funds outside the trade window, unless you have a good reason to trust them substantially, you should decline and request to trade case/crate keys instead. Still often using Steam Wallet, but in a different technique, there is an old and evolved method of scamming sometimes called a Glim Drop or Bait and Switch. The scammer will have an expensive item, and advertise they want a very specific rare, but relatively worthless or hard-to-sell item in return. The scammer is firm in that this is the only item they want. Conveniently, someone else nearby has it, usually on the Steam Market but sometimes in a trade server or a friend of the scammer contacting you around the same time. The item, often a rare/new emoticon or foil trading card but sometimes something else difficult to find, is substantially overpriced by the seller, but still below the price for what you'd expect to spend for the expensive item. No matter how you barter, even pointing to a market listing and offering more than the marketed item is priced at in keys, the scammer will refuse anything except that one rare item. What they don't tell you, however, is the scammer bought up all of that one item, and is using the expensive item to sell the rare item from their other account for well more than it's worth. As soon as you buy the item, they will block you and run with the profit, leaving you stuck with a worthless item you won't be able to sell. For this particular scam, it's best to recognize there is no guarantee the seller will honor their trade listing; and unless you already have (or can get without overpaying) the item they're asking for, skip it and move on. As a general rule, if it sounds too good to be true, it probably is. Another common scam type is known as Quick Switching. This can take several forms, but it always ends with the victim receiving something other than what they expected and agreed upon. In a regular trade window, the scammer might have 2 of the same item with different qualities, each worth a vastly different amount, such as an Unusual hat and Vintage hat in TF2, or the same knife in Factory New and Battle Scarred quality. During the trade, the scammer will ask you to add or remove a bunch of items, or possibly add/remove a bunch of items himself, stating he's unhappy with the trade, and wants something really insignificant such as crates or worthless skins. Amidst the spam, the scammer will quickly switch the expensive item for a less expensive item and hope the victim doesn't notice the change. With the same icon visible, the victim may click "Accept" without paying attention to the slight change, and only notice after the scammer has left. In more recent variations of this scam, a scammer may list a valuable item on CSGO Lounge, TF2 Outpost, or an equivalent trading website with an enticing price from their alt account. The alt account will borrow the expensive item, for the sake of listing it, and the trade listing will say to only send trade offers. Once listed, the scammer will switch out the item in the alt account's backpack for a similar-looking item of substantially lower value, such as a Battle-Scarred quality variation, and wait for an unsuspecting victim to jump on the lucrative deal without paying attention to the item quality while sending a trade offer. Similar to the misleading trade listings, scammers also often use counter offers to try and mislead victims about what they are getting. For example, you may send an offer for a burning flames hat in TF2, and a scammer may reply with a counter offer containing a higher price, but the same hat in the same window with dead presidents. Or they may switch out an identical knife for one of a different quality. There are several other variations to how this is done, but all variations of the quick switch scam can be prevented by taking your time and paying close attention to details of items you're trading for. Before committing to any trade, always double-check the item you're receiving is exactly what you're expecting, and if it's not then don't accept the trade. Pay especially close attention to the item quality and other details such as effect. A website you're linked to may ask for your Steam login information, but actually be a fake phishing website. If you enter your username and password, you are giving it to an account hijacker, who will steal all your items. See the account hijack recovery guide. If it doesn't ask for your account information, it may prompt you to download some file such as a screenshot or plugin. Recently, some of these websites say to install an "escrow" client or "steamguard" patch. If you download or open this file, it will infect your computer and the scammer will be able to take control of your account or computer behind the scenes. This is extremely common (77,000 per month according to Valve), and evident from your items later getting traded to someone you don't recognize. See the account hijack recovery guide. Links to SteamRep profiles, reputation threads, or profiles on trading websites, very often belong to someone else who has copied the owner's profile. If someone sends a link to a profile or reputation thread of some sort, it's extremely vital you confirm it's really them, and not just by checking if the profile looks the same. If they linked you to a profile that doesn't match, they are 100% going to try and scam you. Just because a link loads in Steam (as opposed to in a new browser window) doesn't mean it's legit. 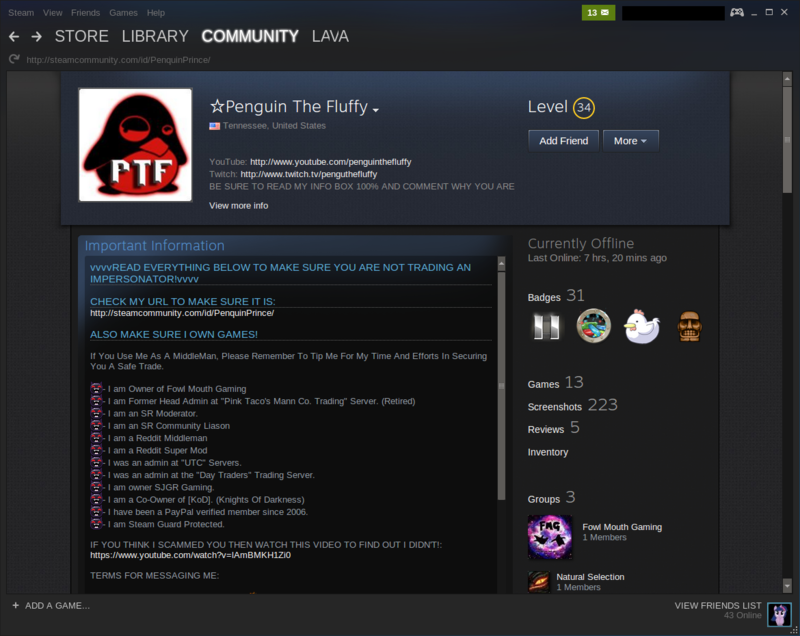 Scammers often link to other people's Steam profiles to appear legitimate. There may be a single letter off, such as a 'q' instead of 'g' or a capital 'i' instead of a lowercase 'L', or the trade offer link may point to someone else's profile than who you expect. In much, much rarer cases than above, links in chat may lead to exploits which can compromise your Steam account. If you see a link that starts with steam:, or it's unusually long and has weird-looking characters in it, you should be extremely suspicious. In many (not all) of the rare cases where some item-stealing or account-stealing exploit is waiting to be patched, you will need to follow a link for it to affect you. If you are given a link to a program, do not follow it. Instead, search for the program yourself on Google. If you follow a link in Steam to install a program, such as a voice application or anti-cheat client a "competitive team" says you need to communicate, it may be fake or have a trojan/RAT bundled in with it, which the scammer will soon use to steal your items or account. If you are given a link to a profile, you should follow this guide to verify the link yourself. If the link looks odd, unsolicited, or suspicious (i.e. steam: links) you should ignore it. Following onto the above about not trusting links, another widespread scam is impersonation. The scammer will pretend to be someone reputable and trustworthy in order for you to send them your items. This seems very simple, straightforward, and obvious; but there are a number of elaborate variations, and impersonating profiles are often very detailed and similar, leaving even the more experienced and knowledgeable traders scratching their heads. It's not just newbies who fall for impersonators. 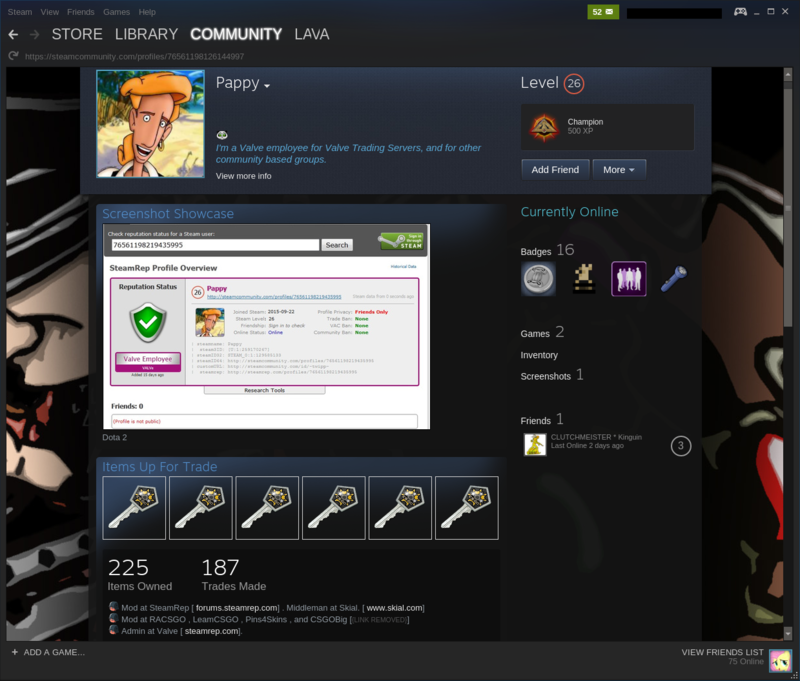 Commonly, scammers will level up brand new (or purchased) Steam profiles to look exactly the same as someone else's profile. The vast majority of these impersonate middlemen from this list, but it's also common for scammers to impersonate other community admins, Valve employees, top-ranking backpacks, streamers, other celebrities, and people from your friends list. These profiles are often made in bulk, and I've personally seen single scammer accounts with over 100 well-copied middleman impersonators in their friend list, ready to scam. Bear in mind, a single stolen knife or unusual dropped on the community market can often more than pay for the trading cards used to level several accounts past 100. Here is an example impersonation of Penguin the Fluffy - this could easily be made into a closer copy and I've seen better, but notice the profile URL is off by just 1 letter from the real one, and almost all the details on the profile page are identical. Typically, this scam will involve one perpetrator who wants to buy your items at a really good deal, and recommends using a middleman if you don't trust them. The scammer, who himself may look exactly like a community admin, streamer, celebrity, or whatever, will link a middleman's profile, maybe several asking you to pick one. Increasingly, scammers are also impersonating Valve employees (example fake profile), threatening with trade bans or other such consequences in order to pressure victims into acting quickly and carelessly. The links may be to legitimate SteamRep profiles, or Steam profile links misspelled copies from the real middleman (see example above). They may do other things to try and make it seem like you've verified the middleman, but the scammer will suddenly invite their alt account, a copy of the middleman's profile, into a group chat and trick you into believing you're dealing with the real middleman. Once you trade your items, both the "buyer" and the middleman will leave the chat (or kick you), and you won't receive any money. There are thousands of these fake profiles, each actively scamming, and if you don't take the necessary steps to verify who you traded with, you might be one of many new victims that day. If you feel pressured or rushed by either the middleman or the buyer, we recommend you back out of the trade. I can't stress it enough: please follow these steps to confirm who you're trading with before you make the trade. A more complicated, but perhaps even more common form of the impersonation scam is often known as the trusted friend scam. In this case, a buyer will express interest in paying a (more than) reasonable price for your items, something around your buyout, but make up an excuse for you to temporarily trade your items to a "trusted friend". Excuses may include checking if your item is "duped" or "glitched", proving you're trustworthy, or some other nonsensical explanation. The scammer will ask for a link to your friend's profile so they can add your friend (and possibly perform the 2-part variation of this scam). After all, since you trust your friend, this seems harmless enough, right? This is where the scam starts. The scammer will use their alt account to copy your friend's profile, and invite the copy into a group chat with you. Meanwhile, an additional profile will be used to copy your own profile, and invite your imposter into a group chat with your friend if they accepted. You and your friend will both be in a different chat, with a separate imposter, thinking you're looking at your friend. The scammer will keep both group chats open, and pretend to be the friend in each respective group chat, asking both you and your friend to send items to "eachother" as proof of your trust relationship, while actually sending them to the scammer's alt accounts. The 2nd part of this scam takes advantage of someone who might be familiar with the scam, and is trying to waste the scammer's time. While you may have seen this a hundred times, there is a good chance your non-trader friend has not. So if you safely trade your items to your actual friend, the scammer will impersonate you to the friend, citing the details of this arrangement you just explained explained to them, and ask for your items "returned" to his alt. Once the scammer has your items, they will either proceed to ask for additional items until you both catch on, or leave the group chat. To avoid the trusted friend scam, we recommend you back out at the very first sign of someone trying this. Do not attempt to troll the scammer, because as explained above, they will often succeed in stealing your items from your friend in part 2. If for some reason you do need to send items to your friend, you should always send friend requests directly from your friends list, and confirm you're really speaking to your friend over another secure channel such as telephone or a voice chat. Do not send trade requests from group chat, and do not accept incoming trade requests unless you are receiving the items. A lot of misinformation has been spread around about what middlemen are for and what they do. Valve recommends you not use middlemen at all, but they also recommend not trading for anything outside the trade window. Generally speaking, you should not need a middleman. A middleman is a trusted third party who holds items during an exchange where one or both parties do not trust the other, but they can agree to both trust and feel comfortable with a third person who holds items for them. It should go without saying, the middleman is not affiliated with Valve in any fashion whatsoever.